I’ve done a few patterns so far and they all worked out fine. Working on the Red Heart Royal Crochet Onesie Patter and the Upper Back/Left front portion doesn’t see to be making any sense to me. The attached picture is what I did so far. Am I on the right track? What is it talking about “free loops” in Left Front Row 2? Hi Krog. 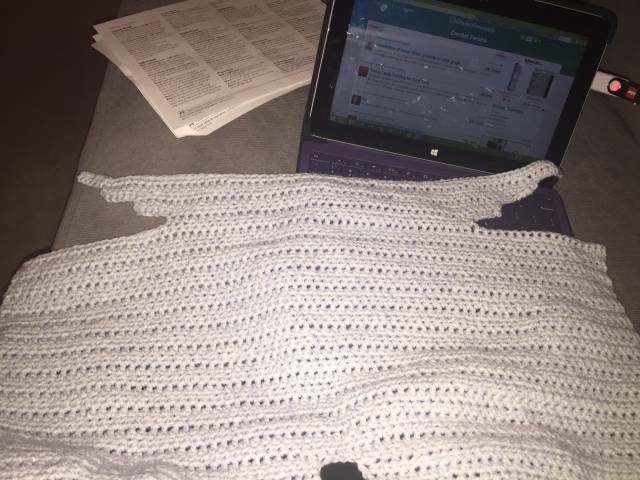 I haven’t done this pattern, but just reading it and looking at your picture I’d say you are doing ok. Looks like you need to work more rows of hdc on your upper back to the depth they say so your sleeves start to form. The next bit sounds tricky but i think the free loops are the underside of the chains you made when shaping the arm. So join the yarn in the armpit, go out across to the side (button opening), turn and head back in towards the armpit but carry on round on to the bottom of the sleeve (the first “step” of the shaping). Then turn and go back out to the edge, turn and head back across the armpit and on to the second “step” of the shaping etc. You are working the sleeve fronts onto the sleeve backs as you go….is this making any sense?! In my head this works but i might just have to try it myself later!! Enjoy!